Both discovered by Johann Elert Bode in 1774. M81 is one of the easiest and most rewarding galaxies to observe for the amateur astronomer on the northern hemisphere, because with its total visual brightness of about 6.8 magnitudes it can be found with small instruments. The pronounced grand-design spiral galaxy M81 forms a most conspicuous physical pair with its neighbor, M82, and is the brightest and probably dominant galaxy of a nearby group called M81 group. A few tens of million years ago, which is semi-recently on the cosmic time scale, a close encounter occurred between the galaxies M81 and M82. During this event, larger and more massive M81 has dramatically deformed M82 by gravitational interaction. The encounter has also left traces in the spiral pattern of the brighter and larger galaxy M81, first making it overall more pronounced, and second in the form of the dark linear feature in the lower left of the nuclear region. The galaxies are still close together, their centers separated by a linear distance of only about 150,000 light years. M81 is the first of the four objects originally discovered by Johann Elert Bode, who found it, together with its neighbor M82, on December 31, 1774. Bode described it as a "nebulous patch", about 0.75 deg away from M82, which "appears mostly round and has a dense nucleus in the middle," and included it as No. 17 in his list. Pierre Méchain independently rediscovered both galaxies as nebulous patches in August 1779 and reported them to Charles Messier, who added them to his catalog after his position measurement on February 9, 1781. In the infrared light, M82 is the brightest galaxy in the sky; it exhibits a so-called infrared excess (it is much brighter at infrared wavelengths than in the visible part of the spectrum). Recently, over 100 freshly-formed (young) globular clusters have been discovered with the Hubble Space Telescope. Their formation is probably another effect triggered by the encounter with M81. It was estimated that the most recent tidal encounter occurred between about 50 and several 100 million years ago: STScI's most recent number was 600 million years, when the 100-million-year-long period of heavier interaction began. 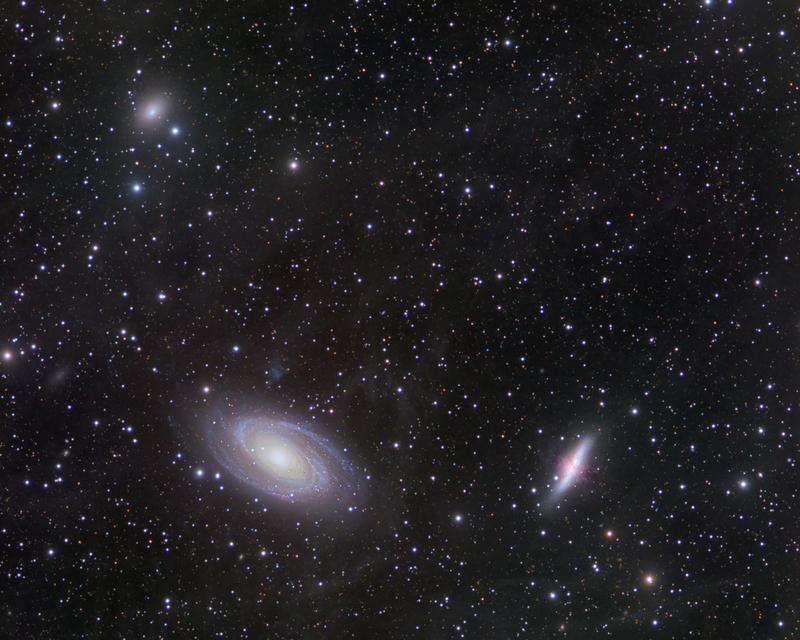 As a member of the M81 group, M82 is 12 million light years distant. M82 was discovered on December 31, 1774 by Johann Elert Bode together with M81; he described it as a "nebulous patch", about 0.75 deg away from M81, which "is very pale and of elongated shape," and cataloged it as No. 18 in his catalog. Pierre Méchain independently rediscovered both galaxies as nebulous patches in August 1779 and reported them to Charles Messier, who added them to his catalog after his position measurement on February 9, 1781. The small fuzzy galaxy bottom left is NGC3077. It was discovered by William Herschel on November 8, 1801. NGC 3077 is a smaller member of the M81 group, located 45' ESE of M81. It looks like an elliptical galaxy, but is peculiar because of two reasons: First, it shows whispy edges and scattered dust clouds similar to M82, probably a result of gravitational interaction with its larger neighbors - similar reason as for M82. Second, this galaxy has an active nucleus which caused Carl Seyfert in 1943 to include it in his list of galaxies, later called Seyfert Galaxies. However, NGC 3077, though an emission line galaxy, is now no longer classified as a Seyfert galaxy. Ambient temp 10C; camera temp -5C; No Moon.